By Dax415, December 4, 2006 in The Workshop! I can't say I've done an exhaustive search but does anyone know if anyone's been successful in modifying the Hasegawa VF-1 legs/engines? By that, I mean, the part after the "knee" where on the Hasegawa models, it slopes down a bit. It didn't bother me, all those years looking at other people's amazing models, but now that I've got my own, it's driving me nuts! The joint is very strong as it is, so modifying it is sure to weaken it somewhat. Just wondered if this was irritating to anyone else as it is to me? Interests:Like make practical solutions to impractical problems. Build small scale aircraft and mecha. 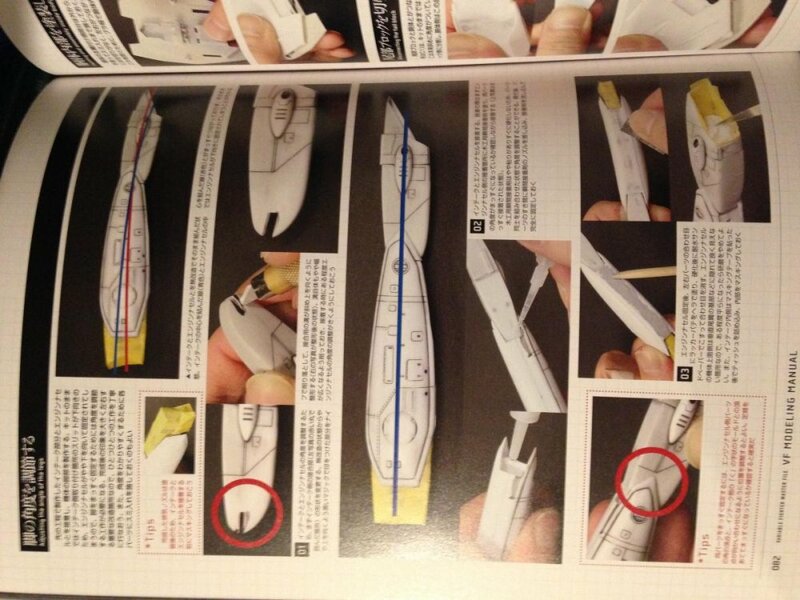 If the joint i strong you could is carefully measure the part and use a trick I used to do on older kits like the old macross Arii batroid models, 1st you take a piece on plastic from the kit or fine shavings, possibly some cellophane and fill the small excess space with non abrasive material. First you measure how much is missing If the joint is just unable to hold the weight consider joint reconstruction or save yourself some time and simply fill the joint with some fine non abrasive material that will create pressure in the joint. I stay away from chemical fillers instead try freezer cellophane the kind used to wrap food up( remember use no glue if possible). or simple get a tight smooth fit without the hassle of butchering the kit. As a rule if it's tight is damaging the joint if it is finger tight( able to move with only a little push)then you aren't damaging the joint. Here's a fantastic tutorial that I happened to come across. The explanations are so simple and effective, I thought I should share this. Thanks a lot for this! I appreciate it. Just found this again, anyone want to have this pinned? If so, probably a good idea to ask the mods if its ok. I bump this thread every now and then, anyone want me to start this back up? Hey cool! I remember this thread! Now why did it never get pinned? I always thought it was a good idea. Sort of a on stop thread that linked to all the scratched and modified model builds - makes them easier to get to. I mean considering how long it takes me to finish a build, by the time I'm ready to try something that someone else on the boards did, their thread could be buried in the depths of MW. Meh, maybe it's just me though. Anyway I'd be up for seeing more. MODs - Any chance we can sticky this one? I see it's at least in the right area. No Doubt, but by default it will also have a lot of straight out of box builds and various other subject matter related to the workshop theme. My thinking is that this thread could be used by folks once their dedicated scratch/modification build thread has been completed. Sort of like this. star a thread for your latest scratch/mod build. update /respond to posts until the build is complete. Then come here and post a link to it so that it stays on the first page of the forum and thus folks can find the thread easily later on. That leaves it up to the thread starter to post the link to their build, so no one person has to manage/update it. Ok guys, I'll try to keep up with this thread and add more. Who knows maybe it will help someone out. Any suggestions for more threads to add to the topic? I lost track of that one guy modifying the 1/60 toy, that is a must have for this section even though he is modifying a toy. I would advice with any new endeavor like this to start small... or even big would be fine as long as you are able to live with your creation even if you happen to destroy it in the end. There's no way to acomplish your end goal and acquire experience unless you take the first step even if the result is failure.. keep in mind the time and monetary investment in it. Clothes or paper pins/clips to hold parts for glueing or painting. Wires and small metal and plastic tubing of different gauges and strengths. Soft trasparent plastic toy box encasings that I use to make windows and such. Save discarded spruce parts as greebles for future scratchbuilding parts. Glass and plastics jars/containers that can be used for mixing paints and also to safeguard small pieces. Set of different exacto blades. Paper; just regular plain white paper for drawing, scketching and also soft paper towels for drying and such. Which part are you talking about? I have a 1/72 VF-1S Strike Battroid or is it fighter version this is an issue? Actually if you compare the two I believe the Battroid kit has the right shaped lower leg (bigger dimensions) than the skinny fighter version and actually matches the 1/48 Valkyrie better which is IMHO the most accurate interpretation of the line art in fighter mode. Quick response, fighter mode is really the only issue. And only non super/strike, for that matter. And man, I need to finish that kit! The SoftBank VF Modeling Manual shows this mod, too. But your thread is in English . Does it really? I was looking all over the place for tips on what I should do and after failing to find anything, figured I needed to think outside the box and come up with something on my own. I'll have to look into that modelling manual - I recall seeing it a few years back and thought it was a very nice thing to have for builds in the future. Might be informative. I don't have a plain Hasegawa VF-1… only the Strike and Elintseeker. That looks like pretty much what I did. I don't know what they used to fill in the old notch but I'm glad I'm not the only one who considered the leg alignment to be a bit of an eyesore. There is some good stuff in here! Thanks for resurrecting and pinning this thread! Still more expensive than buying of Ebay an old dental vaccum former, but interesting! $349 for just a box with a heating element and not even a pump? What a ridiculous ripoff. Hobbyist have been making small scale vacuumformers out of scrap material laying for decades and that costs only an hour of your time. Got an oven and a vacuum cleaner? You're 90% there to a vacuumformer. RC Airplane builders have a ton of info on their sites on making them. I made one when I was 16 for making canopies on P51 and BF109 Slope Soarers MANY MANY MANY years ago. Frame to hold the plastic sheet, Clean over to heat it in until is JUST begins to sag, a Form to stretch it over, a sheet of peg board (holes all over it already) as a base and a simple box underneath with a nozzle to hook up the Home Vacuum too. Job done and same results. Just takes a few minutes instead of 20 secs like theirs. I used to use the grill setting on my mums oven with the sheet wedged between two same sized picture frames. As soon as you saw it start to sag you'd pull it from the oven and slam it down over the form then hit the vacuum cleaner button to finish dragging it into shape. When it come to vac forming, there is a wealth of info on you tube and various rc plane builders websites. You can literally make one from junk that most of us have already at home and in our workshops. Hey guys I have an idea in my head for a project but have a question for the scratch builders. I want to build the base from cardboard. What do you guys use to cover the cardboard that you can prep to paint? It will be kind of large scale but not too big. I'm hoping for something inexpensive. My original plan was to use styrene and aves apoxie but was wondering if there's something else I should look into. Interests:SciFi, Machining, Art, Cars, Anime, Star Wars, Reading, photography, 3D modeling, Photoshop, etc. I use Varathane to seal cardboard & paper. Heavy spray coat will soak in and seal it pretty good.